Just completed another test on my Nexus 7 2012. Still runs great, looking forward to trying the next build! Great job fixing the fullscreen bugs etc. The floating text seems no bigger on any of my devices - still causes eye strain to read. Smart radius still too large. Magnifying glass didn't act as a toggle for me - same behaviour as before. For those of you stuck on 'connecting to server' on Testflight, delete the app's cache / data in app settings, then try again. Fixed it for me. @DannyBarkley I agree, the floating text looks the same size to me, and the magnifying glass is not a toggle, but the press-and-hold now works as expected (unlike before). Text doesn't seem any bigger on my Samsung galaxy tab 2 10.1. The magnifying glass is press and hold, which is fine. The only downfall is that the scrolling seems jittery and laggy now. I was going to note this after I'd tested, have to say it's a great implementation and a far better choice than a toggle, at least in my opinion. Another round down, looks like more bugs were squashed, in previous builds it wasn't intuitive to go from movement to looting and back smoothly, didn't run into any problems this time around. BTW, in the upper-left-most corner of the map, is there supposed to be a slightly sparkly animation every 5 seconds or so? Doesn't detract or anything, but thought I should mention it in case it's indicative of display issues down the road. @Justphil, that's just the number in-game; it's cosmetic, but could do to be updated. DLing #19 now, but I'm just curious...I can't think of a game I have currently (relatively few in the past) that allows any (mobile) device I have to go to sleep...I would prefer it doesn't, but why does this game? At first I thought it only did on my Note 2 and not on my Note 10.1...but realized I have screen off set to 10 minutes on the tablet, so I backed it down and it does it on that as well. BTW, in the upper-left-most corner of the map, is there supposed to be a slightly sparkly animation every 5 seconds or so? Doesn't detract or anything, but thought I should mention it in case it's indicative of display issues down the road. That is a fish jumping out of the water, it has always been there. There is some bug with little rooms. Simply, the room is cut off the screen. This happen to me in the two houses that you find an enemy. EDIT: If you zoom in, the room get's bigger and move gradually to the center of the screen and the black border move to the right until dissappear. If you zoom out, the black border returns. Test run on my nexus 7 (updated to 4.4.2) and it is working great has expected no obvious glitches. For me, while inside a smaller building, if I pinch-zoom too far out, it starts cutting off on the right-side of the image. The smart radius is still problematic on tightly-enclosed indoor spaces, e.g. 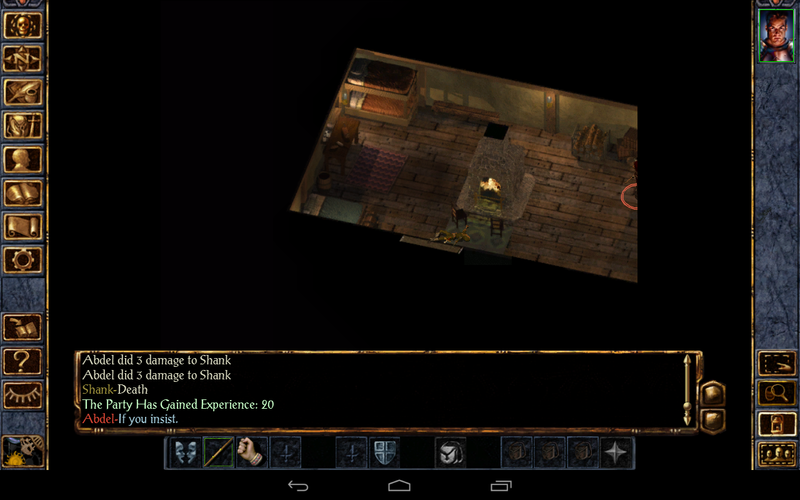 upstairs Candlekeep in. Had an odd bug. If I equip a shield on Absmells and then drop a dagger in the same slot as if going to TWF then both items occupy the same slot, I would expect the shield to flip back into the inventory. Also having the screen cut off thingie. You need to tell BG where to put it. It's waiting for you to touch an empty slot in your inventory. That's not expected behaviour. It should automatically drop back into inventory if replaced with another item. What if your inventory is full? Do you drop the shield into inventory and drop one of the other inventory items on the ground? There should always be one space free in your inventory. The space from the new item you just placed in the slot. the old item should then drop into this inventory space. What if the dagger you're putting in your off-hand slot came from a quick-weapon slot? IMHO this is how the magnifying glass icon should work. Great job though. Thing's are looking positive. Good point. Just retested and the shield is stuck to the finger position. Exiting the inventory screen without placing it in the inventory results in a message stating 'You put back the item that was in your hand when you left this screen' when you go back into the inventory. The shield in now in an inventory slot. If you try the same thing with a full inventory you get the same message and extra item is dumped on the floor. Are the character sounds disabled in the test build, or are they supposed to be working? It depends on which sounds you mean; Abdel's sounds should all be playing, as well as anyone in Candlekeep. The other sound sets may not be working.